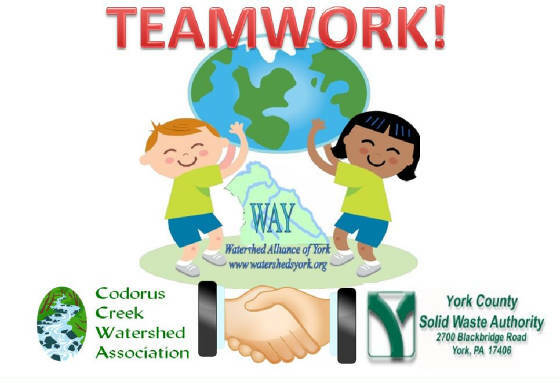 Volunteers from the Codorus Creek Watershed Association and the York County Solid Waste Authority recently combined efforts & used the power of teamwork to clean up an illegal dump site along the banks of the Codorus Creek. The site, located under the Route 30 Bridge in Springettsbury Township, is along the east bank of the Codorus Creek, where the creek continues its journey from the urbanized areas of York into, and through, the increasingly rural areas north and east of York City. Many years' worth of garbage and debris had piled up along the banks in this area. This accumulation of discarded items was a detriment to the environment and adversely affected the aesthetics of the area. Additionally, the cleanup site is part of the planned route of the Northern Extension of the Heritage Rail Trail, a valued asset in York and part of the York County Parks System. Cleaning up this area, therefore, served many purposes and will go a long way to promote, and maintain, the beauty of this historic waterway! THANK YOU TO ALL THE VOLUNTEERS WHO HELPED US MAKE A DIFFERENCE! CLICK THE LINK BELOW TO VIEW PHOTOS OF THE CLEANUP DAY! CLICK BELOW TO VIEW PICTURES NOW!